The north of Iceland often feels as though it is miles from anywhere, even though we are only about two and a half hours drive from the capital of Reykjavik. I imagine it’s got something to do with the fact that we are close neighbours with the Arctic Circle up here. 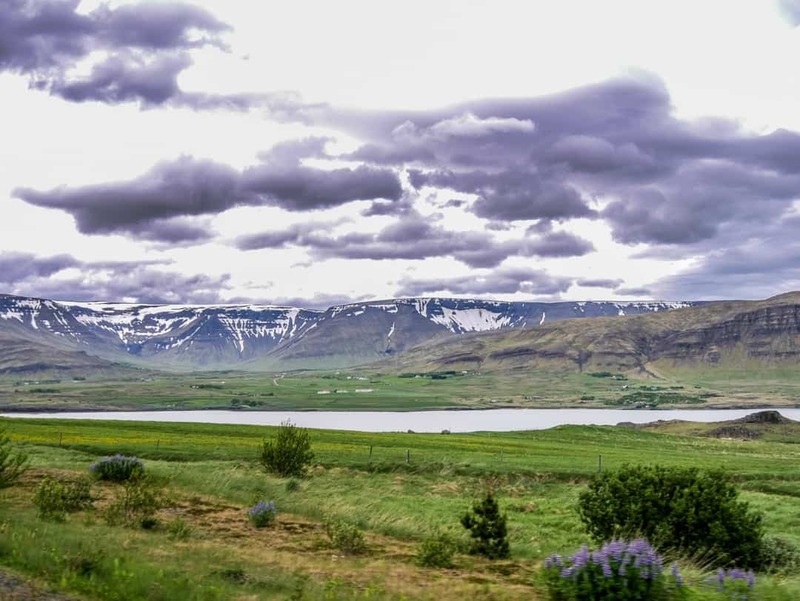 We left the beauty of Akureyri behind us as we settled into the latter part of our road trip around Iceland’s Ring Road. As has been the case for the entire drive, the landscapes keep changing, delivering more unusual imagery, just when you think it can’t offer up anything different. As we head further west, we drive through an area full of low-level hills. We’ve reached the entrance to the Vatnsdalur valley. These hills, known as Vatnsdalshólar were thought to have been formed by an enormous landslide. The hills cover an area of around four square kilometres. We are on day six now of the trip and today’s first destination is Hvammstangi, the most western village in the northern region. We were off to see if we could find the seals that make their home along the western side of the Vatnsnes Peninsula. It’s known as one of the best places to see seals in Iceland. The weather is a bit wicked today though, and the locals have mentioned to us that we should lower our expectations. The seals don’t really like the wind! It sounds ludicrous given their habitat is the freezing ocean waters, but I don’t profess to be at all knowledgeable when it comes to seal’s behaviour. It’s the best spot in Iceland to see seals in their natural environment so we will just have to cross our fingers and hope for the best. Looking for a seal watching tour? Click here for prices. In the event that we don’t find them, as we take a turn off the Ring Road, we are still wowed by the scenery. Iceland just keeps on giving in that regard. We headed to Svalbarð, one of the better spots to see the seals near Hvammstangi. Here there is a parking lot and easy to walk tracks that lead right out to the coast. 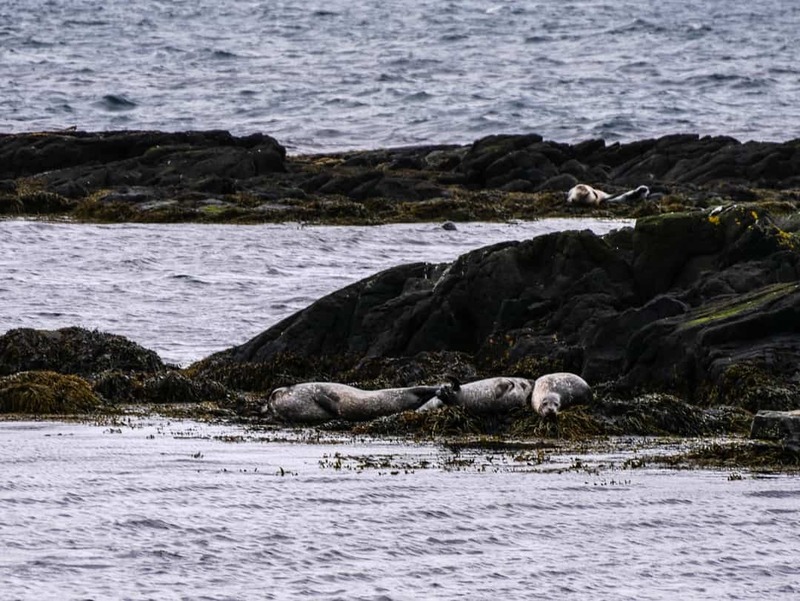 We see immediately why this is one of the best locations for seal watching in Iceland. From here, you get free access to the coastline, to see them cavorting in their natural habitat. The wind is howling as we head towards the rocks, and despite my hands feeling as though they would crack from the cold, I brave it to get my camera ready, just in case. We didn’t have to wait for too long. As we got closer and closer, the still mounds of flesh, camouflaged into the brown and grey rocks became evident. The numbers were small but it was still exciting to be able to see them. We sat for quite a while on the rocks, watching them move occasionally, sometimes slithering down into the water’s edge or having a mock fight. Several take the real plunge, popping their heads up closer to where we are sitting. To get the full seal experience there is an Iceland Seal Centre in Hvammstangi. There’s also an abundance of birdlife here. From Hvammstangi, the Ring road takes us further south. We made a decision not to go out into the West Fjords. As beautiful as we were sure they would be, we just didn’t want to hasten our trip at the end to divert out there. We were pleased with the knowledge that we had been into the eastern fjords and in and out of many of the lesser known ones. Borgarnes was the next “main” town on this route. If you are heading out to the Snaefellsnes Peninsula, this is where you will access it from. Borgarnes itself is a pretty town surrounded by snow-capped mountains and waters of the Greenland Sea. Established as a trading centre in 1867, just under 2,000 people now call it home. From a visitor’s perspective, most people now come here either on their way through to the Snaefellsnes or to walk the notable hiking trails here. We couldn’t resist stopping in such a pretty location so made it our rest stop for lunch. Located only about a 30-minute drive from Reykjavik and the largest town in West Iceland, Akranes is well known for its lighthouses, but not much else. Built on the fishing industry, this town of around 7,000 people now plays host to tourists who come and admire its natural beauty, and of course, the lighthouses. For reasons unknown, I didn’t get a photo of both of these lighthouses in the one image which is silly of me as this is what is quite significant here. From the peninsula here you can see across to Reykjavik on a clear day. The smaller lighthouse, pictured below, is one of the oldest in all of Iceland. It was built in 1918 and sits right on the very end of the peninsula known as Breið. The taller lighthouse was built in 1944 and commissioned in 1947. Akranesviti, as it is known, is now open to the public, both to get an insight into the unusual living quarters and also for those amazing panoramic views. Unfortunately, when we were there, it was being repainted so even though we got to climb the stairs, we couldn’t access the views at the top. As we have made our way anti-clockwise around Iceland, we have zig-zagged in and around multiple peninsulas and fjords. All of that takes time, but that is what slow travel is all about. The Ring Road is the most efficient way of circumnavigating the country, but there is always plenty of opportunities to get off it and take a detour. Detours are the best as it is usually during such dalliances off the main route that we find really cool things. As we left Akranes however, we came to a tunnel. It was the first tunnel we had seen and we became curious. Up until 1998, travel around the fjord had to be undertaken like any other. It was a long drive around, some 62 kilometres on national highway number one from Borgarnes to Reykjavik. Many residents of Borgarnes and Akranes commute daily to the capital and this would have been one hell of a drive. In 1998, the Hvalfjardargongin tunnel commenced operation, shortening the commute from these cities significantly. It runs 165 metres below sea level and is just under six kilometres long. We decided to give it a go, making our way to the other side of the fjord. It certainly did make a difference. As a commuter, this would be perfect. As a tourist, if you can it’s always better to take the slow roads as they are infinitely more picturesque. We were comfortable with our decision as we’ve done plenty of that, and there was still more to see. Once on the other side, we drove up the eastern side of the fjord, taking in lots of serene spots along the way. With the tunnel now heavily utilised, this area is now free of continual traffic. Meðalfellsvatn Lake looks like the perfect place to have a summer house in Iceland. We wrapped up another day of beautiful sightseeing with another incredible location at the Fossarétt waterfall overnight.